Hall of Gods is a 5 reel, 20 payline slot game featuring wild, scatter and bonus symbols, free spins, and 3 progressive jackpots. 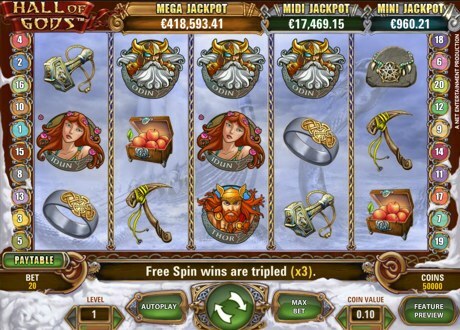 Immerse yourself in Norse mythology in the BIGGEST EVER video slot! Meet the Midgard Serpent in the expanding wild and Odin's ravens on the scatter symbol to win 20 free spins. Then smash your way to riches with Thor's hammer in the bonus round to win one of 3 jackpots. Step into Valhall and meet Odin, Thor, Freya, Loki and Idun. Norse mythology is not known for being benevolent and fuzzy, so the wild feature in this exciting slot game comes in the shape of a dragon and every time you get a wild symbol on reel 2, 3 or 4, it will expand to cover the entire reel giving you really good potentials to win big. Choose between 5 different bet levels and the coins from €0.01 up to €0.5 per line. You will enter the free spins round by collecting 3 or more scatter crows and you receive up to 20 free spins by collecting 5 scatter symbols. All winnings collected from the free spins will be multiplied by x3, except winnings from the bonus round which will be awarded as normal even during free spins. In the bonus round you need to hold on to Thors Hammer and break the shields that will appear on the screen. A jackpot or a cash prize will appear behind the shields and once you have matched 3 amounts or jackpots, the bonus round is over and you'll walk off with the prizes. You can follow the progress of the jackpots at all times from the top of the screen. The largest ever hit Hall of Gods Mega jackpot of £5,450,863.45 was hit by a Scottish Fisherman on October 28, 2013 at BetVictor Casino. The Hall of Gods Mega jackpot is the same across all Net Entertainment powered casinos. Midi and Mini has its own pools on every site, so visit the corresponding online casino to play for the highest grown jackpot(s). Keep the Gods of Valhall on your side and you may walk off with one of the progressive jackpots already tonight.